Oil usually comes in 5 liter or 1 liter containers. A smaller 1 liter bottle is ideal to keep in the boot for top-ups. 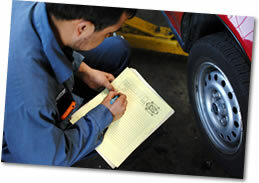 Make sure the car is parked on level ground when checking the oil level or your reading will be inaccurate. On most cars, the difference between the minimum and maximum marks on the dipstick is about one liter. If your car is overheating you should stop straight away. If it’s not safe to stop, turn the heater to hot and the fan speed to max. This helps to draw heat away from the engine. A ‘mayonnaise’ type gunk in the coolant tank is a result of the coolant coming into contact with oil. This is usually caused by a leak inside the engine allowing them to mix and should be investigated by a garage straight away. Keep a bottle of water in the boot in case you need to make an emergency top up to the cooling system. Test your brakes if you’ve driven through deep water. Applying light pressure to the brake pedal will help dry them out. The brake fluid level falls naturally over time as the brakes wear, but if you have to top up often; the car should be checked for leaks. Dirt and grease can clog up t he braking system, so make sure the area around the brake fluid reservoir cap is clean before you remove it. If your steering seems heavier than normal but the fluid level is correct, check your tire pressures. Under-inflated tires are a common and simple cause of heavy steering.